Mother Nature has offered many challenges during this winter season, and today is no exception! Recently Mount Mercy staff alerted us that there is a very high chance that the campus will be closed tomorrow due to an anticipated snow storm. In order to ensure the safety of everyone involved in the Suicide Prevention Lunch and Learn, we have rescheduled this event to Tuesday, February 19th from 11:30 AM- 1:30 PM. If you have already registered, your registration will automatically transfer to the new date. 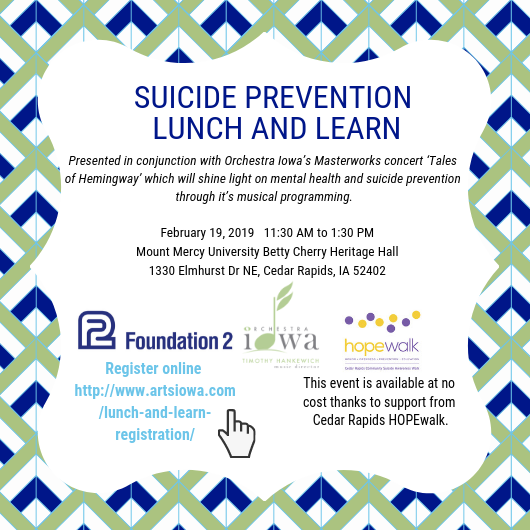 Please join Foundation 2 & Orchestra Iowa for a Lunch & Learn on Tuesday, February 19th from 11:30 – 1:30 PM. The event will include a one-hour presentation by Foundation 2 Crisis Center Program Manager Cheryl Plotz about suicide prevention followed by by a Q&A featuring a special guest panel of experts on suicide prevention and loss, along with those with lived experience related to suicide loss. This lunch and learn is available FREE of charge thanks to support from Cedar Rapids HOPEwalk. All attendees must register prior to the event. A box lunch will be provided to each registered participant. Please note, the provided box lunch items may contain or have come into contact with wheat, eggs, peanuts, tree nuts and milk. We hope to see you on February 19th!